An RV office will take you one step farther than your home office does. Sure, the home office has eliminated the commute to work, but why not make your office portable and just stay on vacation all the time? Do you already have an home business that could easily be taken on the road? Good. Then you’re ready to load up the RV and hit the road. There are lots of online job opportunities that don’t require you to be in one place all the time. Depending on your particular skills and talents, chances are pretty good that you could put your skills to use anywhere! Here are lots of fun ways to make money while you’re RVing. 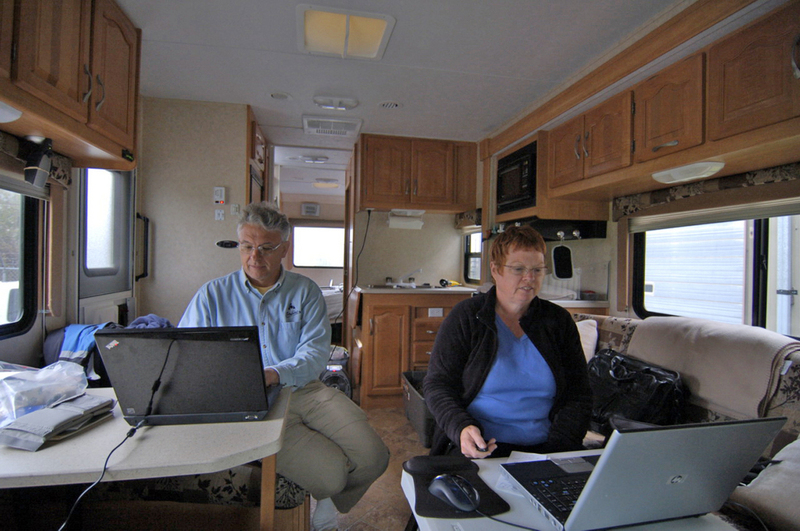 The most important thing for your mobile RV office is being able to maintain access to some basic office electronics and services like a computer, Internet & faxing services, a digital camera, and a cell phone. With a generator (or a set of solar panels) on your RV, you can be miles out in the wilderness and still take care of business while RVing. You actually have a number of different RV power sources available to you. Computers for use when RVing come in all shapes and sizes. The style of computer you choose is completely up to you. Desktops, laptops, and notebooks (or the new netbooks) can easily handle all your computer needs on the road. A good computer desk when you’re RVing is another thing you’ll want to consider — especially if you will be spending a large amount of time at the computer. Or, you could always make your own RV computer workstation. Of course, your computer won’t just be used for work when you’re RVing. Here are the top 10 uses for a computer in your RV. If it’s important to have Internet access on your computer no matter where you are, then satellite Internet service will do the trick. Many RVers are looking for alternatives to satellite. With a USB Internet card plugged into your laptop, you’ll have service whenever you’re within range of a cell phone tower. These can be purchased from cell phone providers like AT&T Laptop Connect or Verizon Mobile Broadband. Many new cell phones offer internet connectivity. Mine can send & receive e-mail and surf the web. Unlimited service is very reasonably priced. Free Wifi hot spots are everywhere. McDonalds, motels, and that quaint little street side cafe where you stop for coffee, they all offer free wireless internet service to draw in customers. You can also turn your RV into a secure Internet hot spot with WiFi In Motion. In the end, there are really a lot of different options for obtaining Internet access while RVing. In fact, there are reasons that you may need to use more than one method when you’re RVing. Here’s how to get better wireless Internet reception in an RV by using antennas. 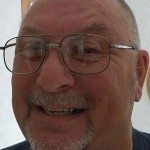 Digital cameras and RVers go hand in hand. With a digital camera, you can take and send pictures anywhere in minutes! Think of it as your personal on-the-go scanner/copier. The digital photos can be emailed directly from your phone or saved to your computer. You can choose a point & shoot digital camera or a more advanced digital SLR camera. It’s easy to find a good digital camera for less than $100 these days. Check out these 10 unusual uses for a digital camera when you’re RVing. There are lots of free Internet faxing services available online. Some will only let you send for free, others will only let you receive for free. Just pick one of each and you’re all set! Or try eFax to send and receive faxes for free for 30 days. Most of the free fax services also offer full fax services for a monthly price. If you’re a heavy user of faxing, a paid service is probably the way to go. Ring Central is another option. It’s not free, but you can get a tollfree phone number for your mobile business and that toll-free number acts as your fax number as well. It’s quite reasonable, and there’s a 30-day free trial. If you’d like to use an actual fax machine instead, scanner/printer/copiers are available everywhere. And they’re rather inexpensive these days too. As an RVer, an all-in-one unit is a good choice — because you’ll need some way to scan and print the faxed items that you send and receive. Truth be told, you probably won’t need to print things on the road as much as you might think. The reason: digital copies are much easier and faster to send and receive than scanning and printing physical copies are. Still, a reasonably priced printer might be handy for your mobile RV office. Everybody has a cell phone these days. But in a business situation, you may want to opt for a plan that offers benefits tailored more to your needs. Business cell phone plans do just that. Some examples: Sprint Business Plans, Verizon Small Business, and AT&T Small Business Plans. Here’s how to turn your computer into a phone so you can make phone calls from your RV. 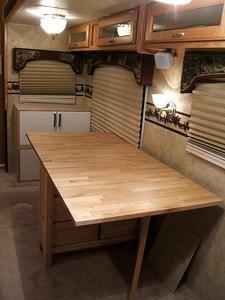 Want to model your mobile RV office after someone else who’s found the best setup? Your RV office can do so much more than just pay your bills or handle personal correspondence. You might even choose a new career; one that better fits the traveling lifestyle. Who knows? Maybe you would like to be a journalist and write RV articles from the road… Sorry, that one’s mine!